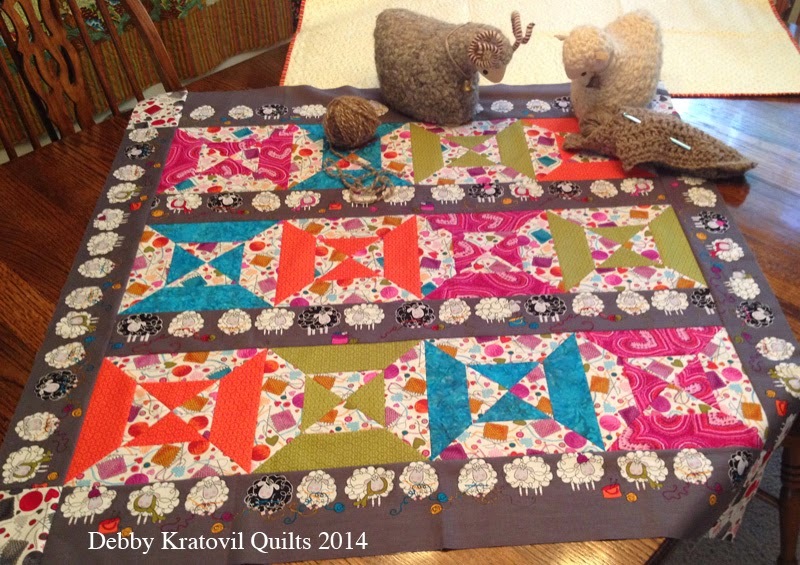 Knitty Sheep Quilt Finally Finished! Congratulations to Cheri S. of Washington who is the winner of the fat quarter bundle of the Wings Collection (from last week). Thanks to everyone who chimed in to let me know what you drink in the mornings! Below is a post I did for Benartex this time 2 years ago. 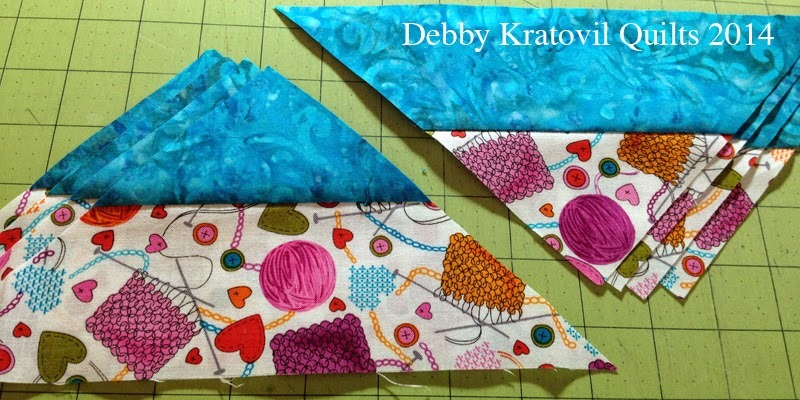 The fabrics are so cute and I pulled out a tried and true technique for making Hourglass Blocks. 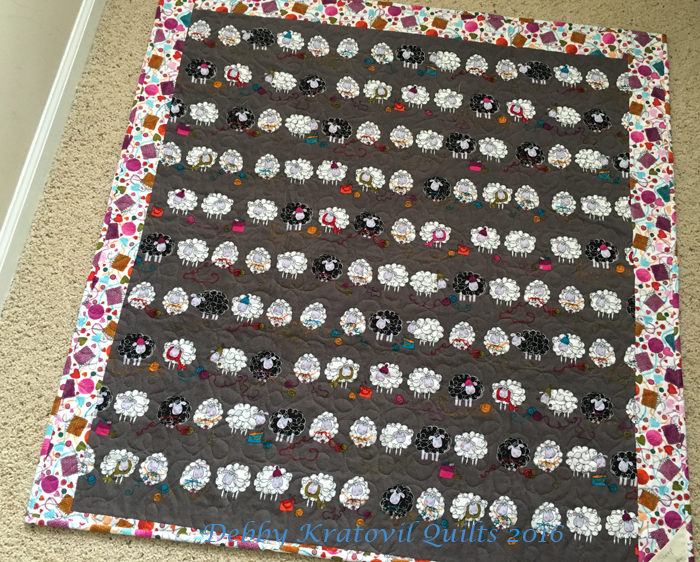 I quilted it this past week and used the gray flannel for the back. I sent it to my 2-1/2 year old granddaughter for a cozy, snuggle-worthy winter blanket. 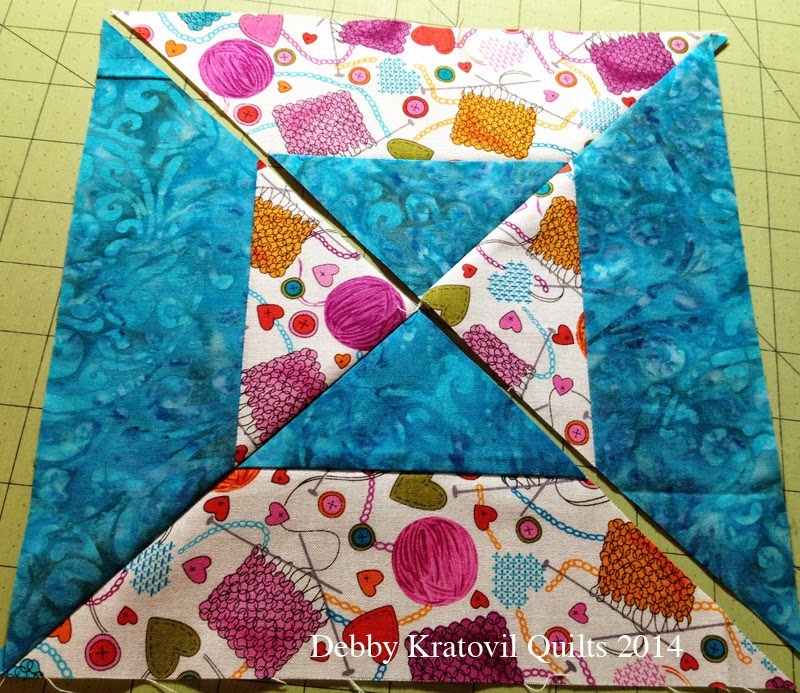 I share the pics of this FINISHED at the end. Hope you enjoy the tutorial! It's natural for sheep to want to knit or crochet, right? 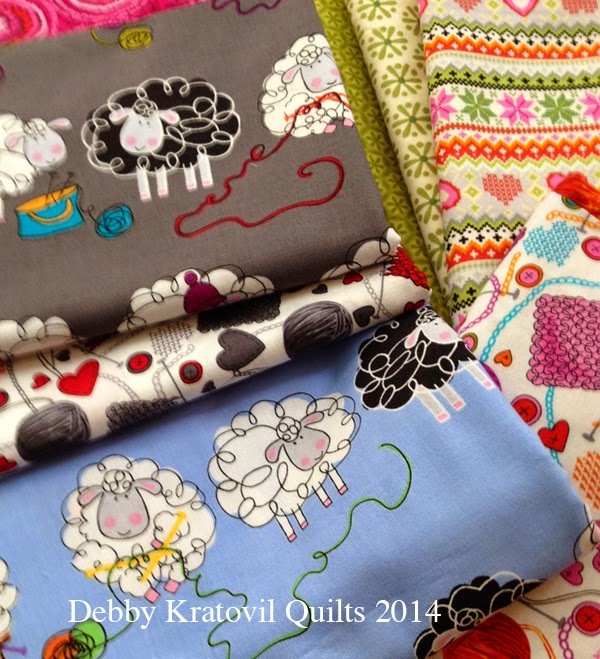 Knitty Sheep, Knitty Sheep: can you knit with wool? No, ma'am. No, ma'am. I never learned in school! What! That sounds so crazy. Did you skip classes just to play? No, ma'am, I took a class to learn how to crochet! Whew! Now that's what I'm talking about! I can't knit and can only crochet. It's refreshing to find wool bearing sheep who know what to do with their hair! 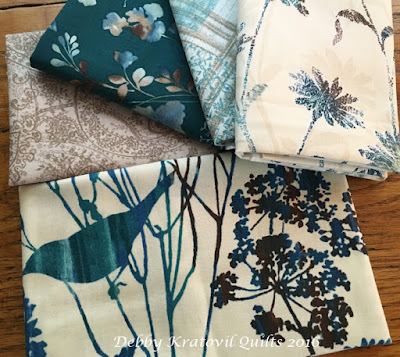 Benartex: Debby, why did you want to work with this collection? Debby: I loved working with the Knitty Kitty Collection a few months ago and made a few items for my crochet supplies (see post here). And now the fabrics are also in flannels. I can think of some cozy things to make for my little grandsons using those. And some flannels to stay cozy and warm . 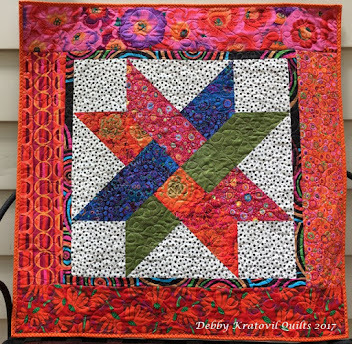 . .
Benartex: How long did it take for you to come up with your idea for our Technique Tuesday? 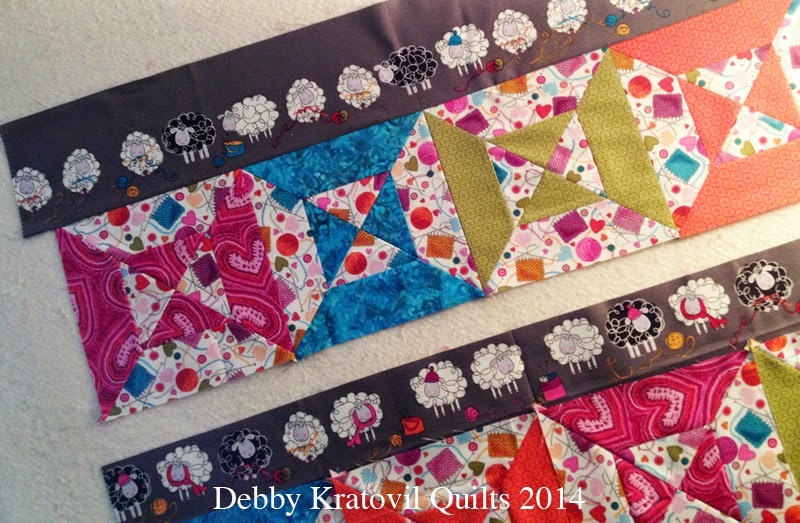 Debby: Well, it usually only takes a day or two for the fabrics to convince me of what they want. Yes, they actually do start whispering once I rescue them from the mailing box. Then they get louder and louder until they convince me. But this time I think they were exhausted from their trip and it took over a week for them to talk to me. 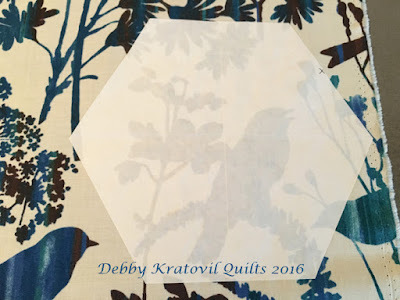 Benartex: And can we see what you did? Debby: Why not? Isn't that what we're all here for? Then I dug through my files and found a tried and true pattern for an Hourglass block using my quick piecing and cutting using a 45˚ ruler (NOT a kaleidoscope ruler). 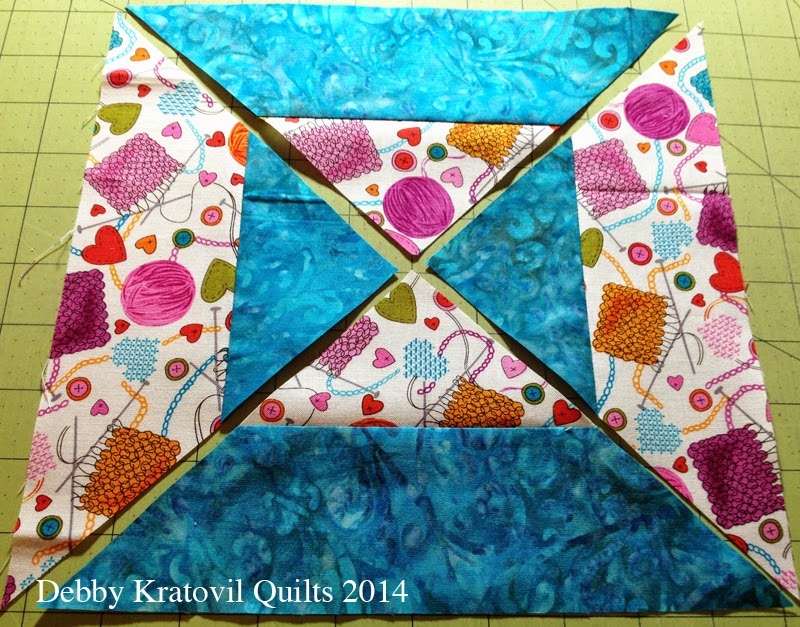 I'm able to get two full blocks from two contrasting fabrics cut 2-3/4" x wof. 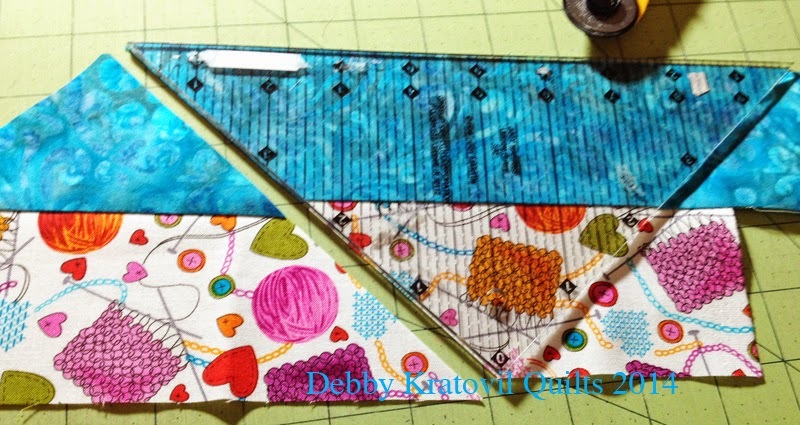 Always press toward the "solid" reading color so the seams will nestle when units are joined together. 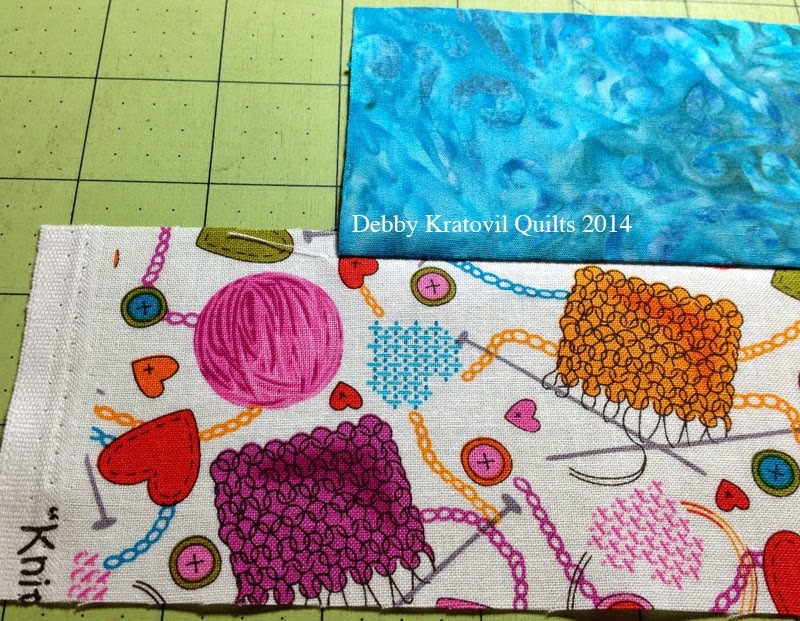 I selected 3 companion fabrics from the Knitty Sheep/Kitty Collection and the perfect blue from a Benartex batik. 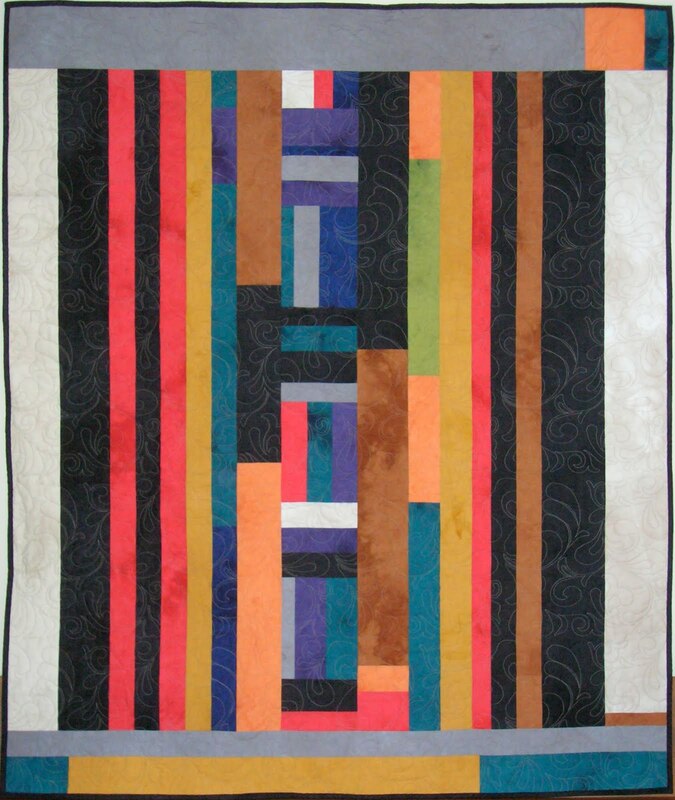 ** Four strips 4" x 36/38". Take care to measure 1/4" from the tips of the sheep heads. This way you won't "intrude" on the heads in the next panel. 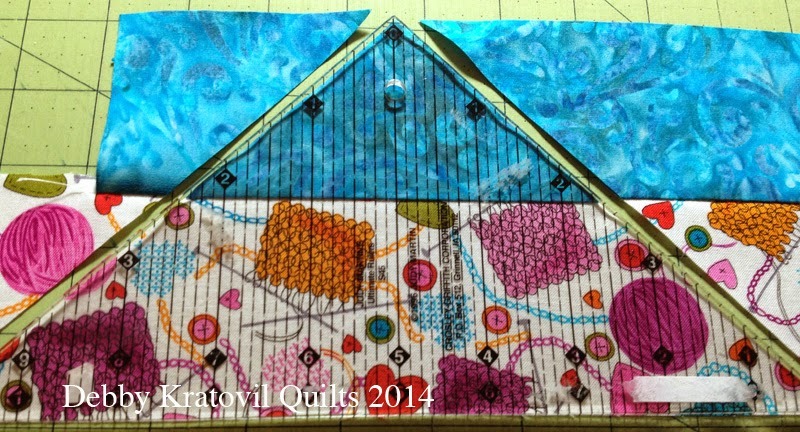 Two strips are used for the quilt center and two are used for the side borders. 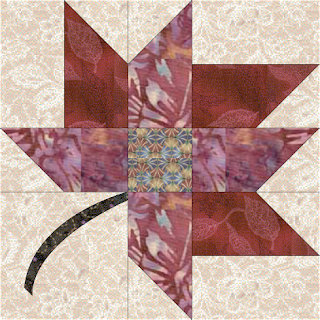 ** Cut two wider borders from the two ends at the selvedges. 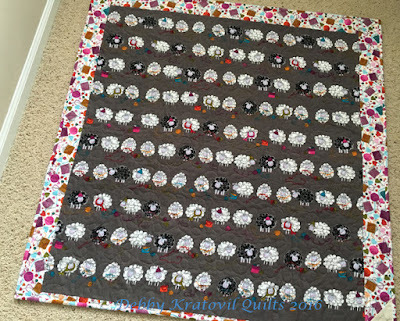 Note that there is more of the gray background fabric on each of the ends. This makes them a natural for the top and bottom borders. Flip flop the ruler across the strip set until you get to the end. Notice that by offsetting the strips as we did at the beginning, it allows us to get ONE MORE cut, thus enough for two blocks per strip set. And how do you arrange them? 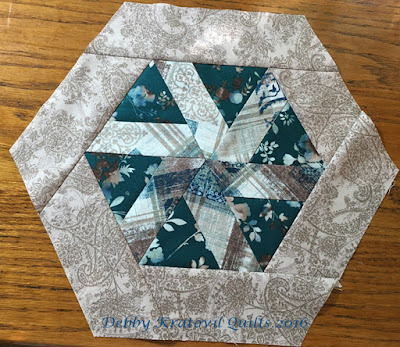 You need for the seams to go in opposite directions from each other, so always press toward the same center triangle. Then you press the center seam open to reduce bulk. Now, can we see the other colors you used? 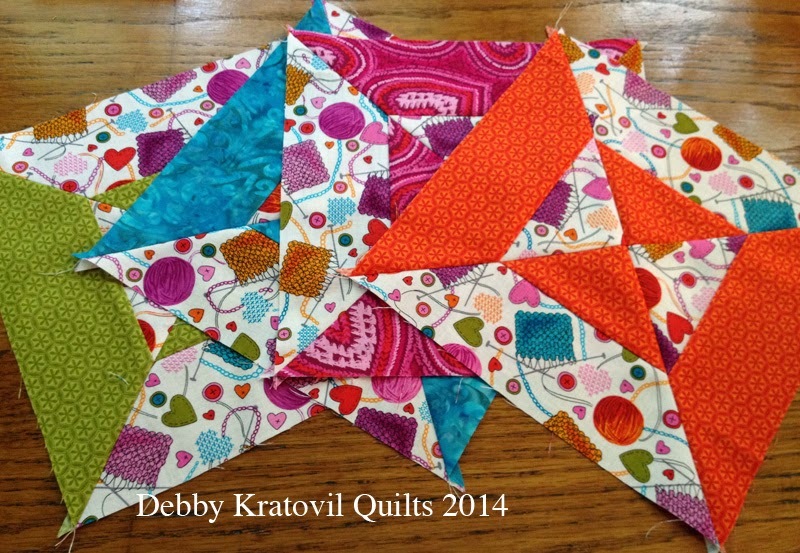 Rows of 4 blocks stitched together. Then joined to a horizontal sheep row. Don't you love these two sheep from Poland? And that awesome wool with crochet hook? 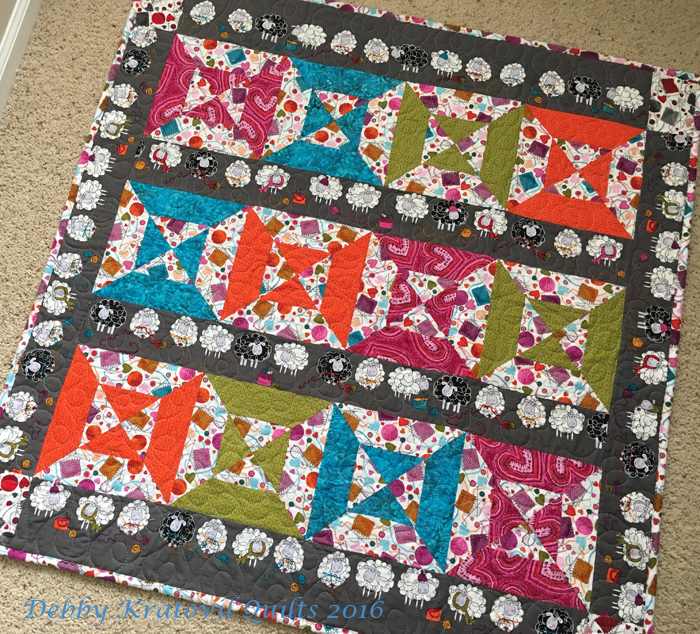 Because I didn't have the inches I needed to cover the entire length of the sides, I cut rectangles from the gray background companion print (like the one used in the blocks). The patches were the size of the side borders (4") and the top/bottom borders (5-1/4" - 6"). Worked perfectly! 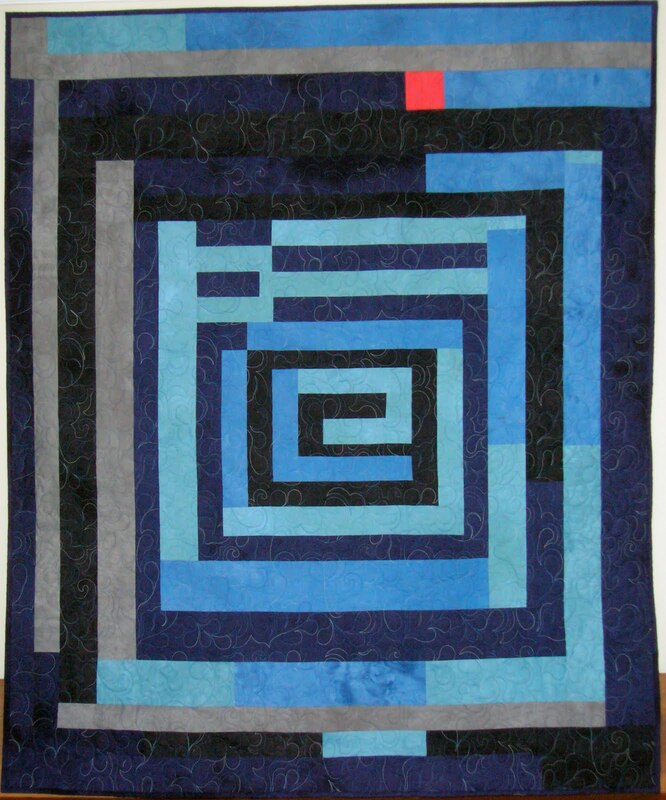 Quilt Size: 43" x 44"
Love these colors. And aren't they such happy looking sheep? 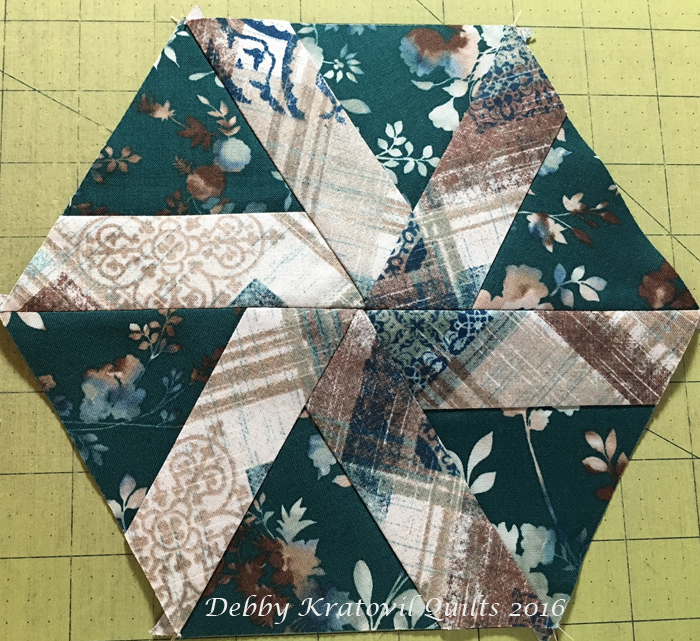 This is a very quick -and fun - block to make. 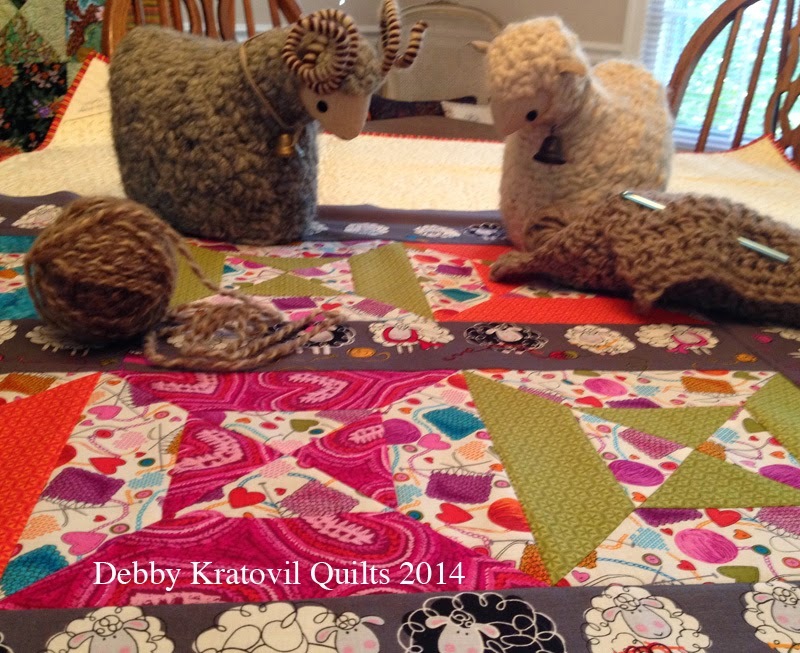 And look at those Knitty Sheep in their rows. Love them all! I hope my little granddaughter doesn't stay awake "counting" all those sheep on the back. But then again, that should put her back to sleep, right? 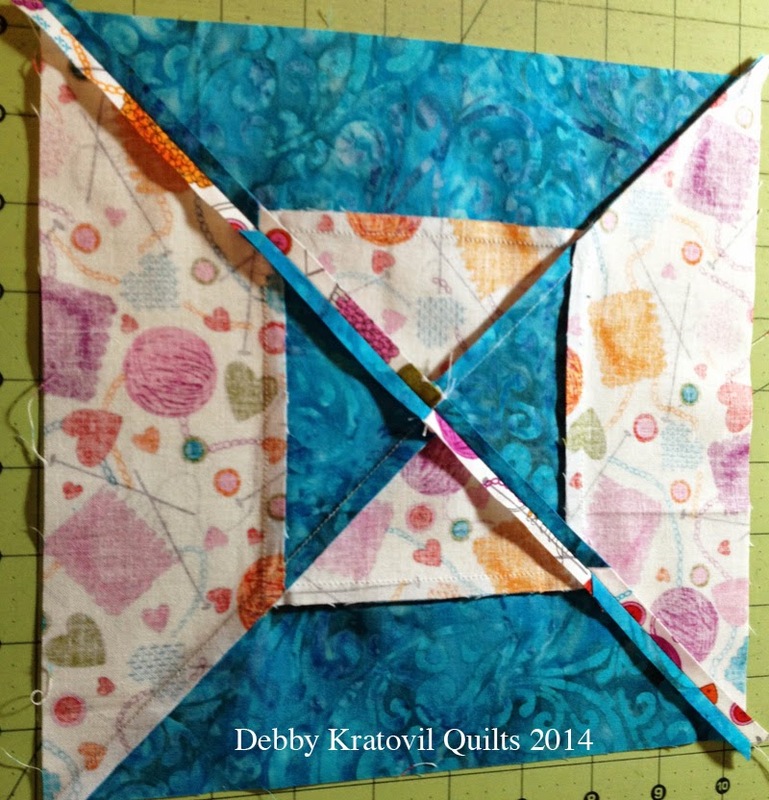 Taking Flight with Wings by Benartex and Giveaway! We have a winner of the fat quarter bundle of Wings. Congratulations to Cheri S. of Washington! What's that freezer paper doing over that bird? There is a fat quarter giveaway. 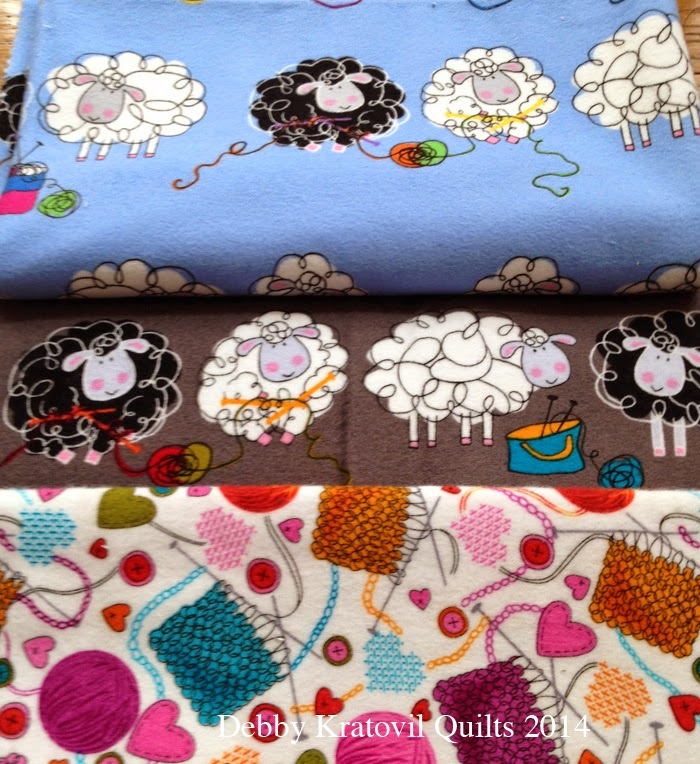 Go take a visit to Sew in Love with Fabric and see what's happening with this collection. Then come back here and tell me what you put in your mug each morning: coffee, tea, Coke? The GIVEAWAY is open until midnight Saturday, October 22. Then I'll pick my winner (and if I don't have a valid email address for you "no-reply comment" bloggers, I go immediately to another blogger). I only give you 24 hours to reply and then I go on to pick another person. Sorry, but we can't let these drag on for a week (and they have!). Just check your email Monday and Tuesday, please. And I appreciate everyone who visits and comments! 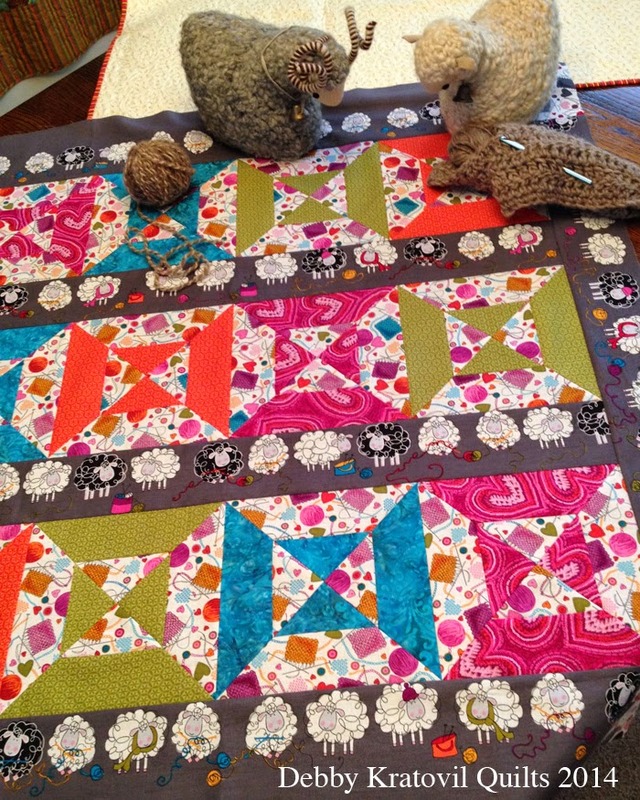 So, now go check it out: Sew in Love with Fabric. Come back on Wednesday (after 9:30 am Eastern time) and see what I did with this delightful collection. 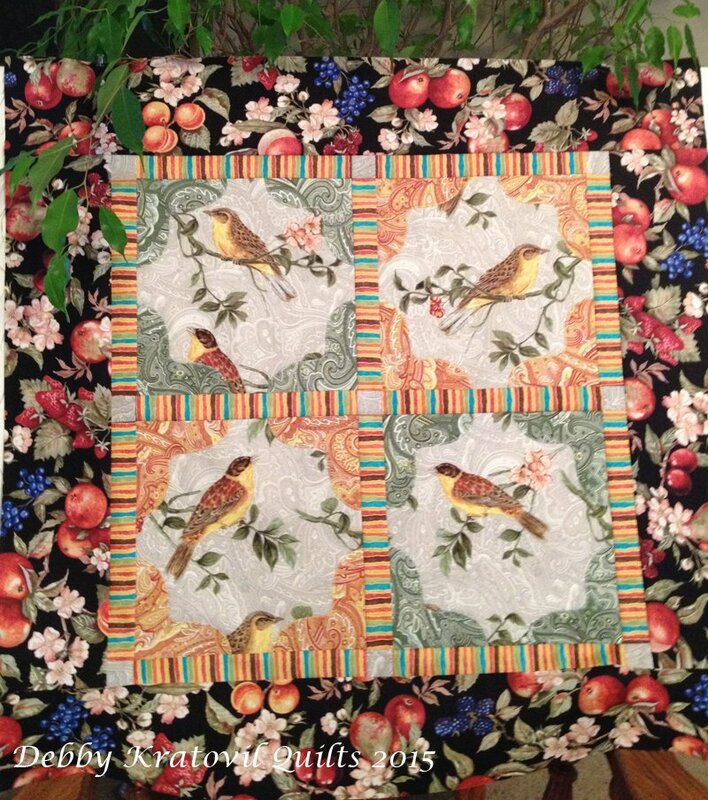 There will be a tutorial at the Benartex blog, Sew in Love with Fabric. But in the meantime, this is what I did with some of the leftovers. This traditional block is a Pinwheel and the inspiration came from The New Hexagon book by Katja Marek. I decided I didn't want to English Paper Piece this, but upsized it for rotary cutting. 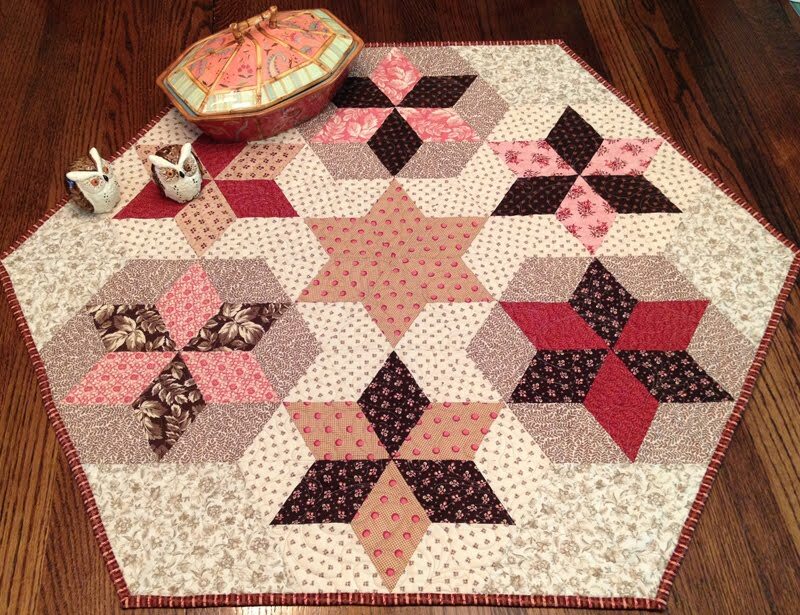 The block is 9" high and with the borders it finishes to 11-1/2". This will become a Mug Rug. Here it is October already! Wow - the year has flown by. 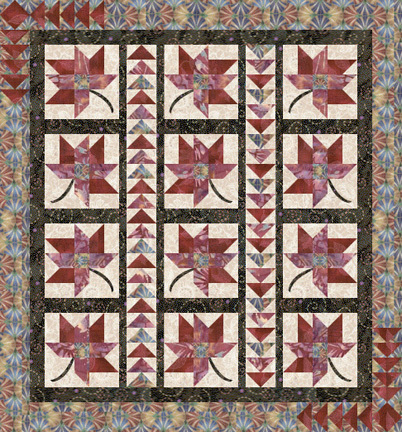 The block represented in the free quilt pattern is Blazing Autumn Leaf. The block in the Quilter's Block a Day Calendar is 10". 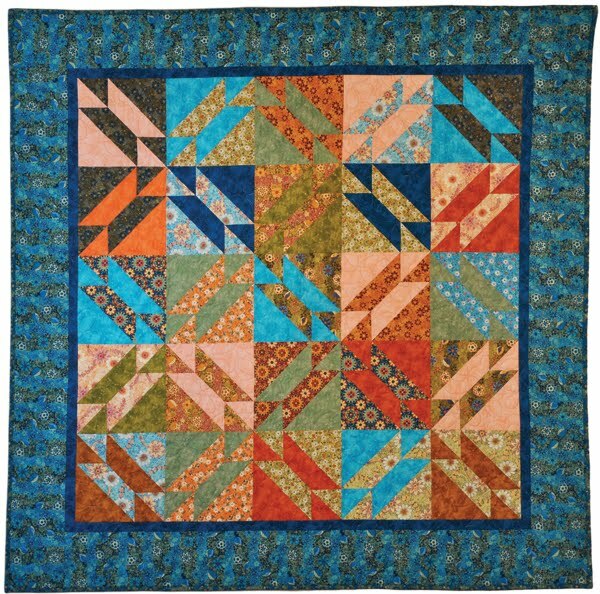 I combined 12 of these blocks with two Flying Geese vertical sashing strips. The Flying Geese appear again in two corners of the outer border. Blazing Autumn Leaves: 55" x 59"
You can download this FREE 3 page pattern for the quilt, Blazing Autumn Leaves, and the helpful one page pdf October Newsletter with tips for making these different triangles. 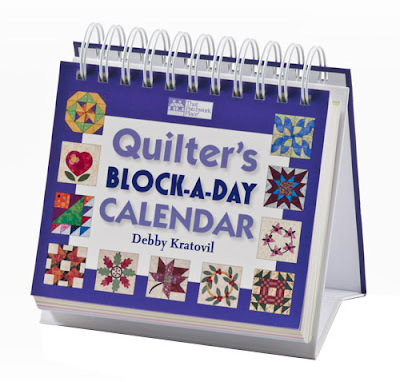 Remember, the pattern is written assuming you have a copy of the calendar. The pattern includes a coloring chart so you can audition your own fabrics and colors.